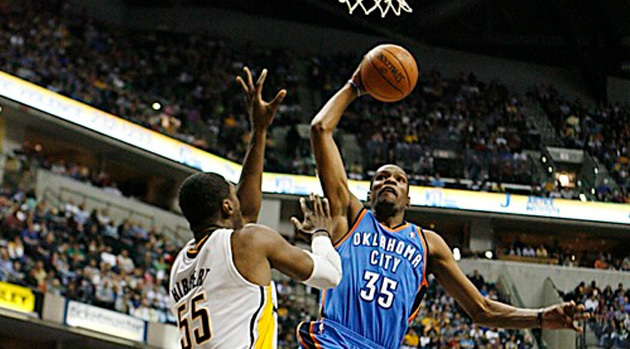 Paul George is a tall, athletic guy… similar to Kevin Durant. He’s got a good defensive reputation, too. George took the majority of Dahntay Jones’ minutes yesterday because Frank Vogel thought he was a better option against the 6’11 Durant. Honorable mentions to Brandan Wright, Tayshaun Prince, and Kawhi Leonard. Nice dunks all around, but only one sent a 7’2 guy stumbling towards the baseline. For this reason Durant earns his third POTD of the season.